Blog Good To Know Pressure Cooker versus Slow Cooker: Which One Is Right for You? Everyone who loves cooking in the traditional way knows that it is not easy. Hence, many homemakers are looking for a highly efficient, very smart, and extremely effective cooking appliance that would help them ease the burden of conventional cooking. Pressure cookers and crock-pots are innovations that lessen the struggle in the kitchen. That is why these two types of cookers are often found in home kitchen. However, that should not always be the case. Pressure cookers and slow cookers are similar in some ways and likewise different in other ways. They are similar in the sense that they both make cooking simpler and easier. On the other hand, they are different on how they cook the food. The moment that you have identified your cooking needs, habits, and styles, that is the time you can determine which one is right for you. It is just fair that before you start comparing the two, you must know how they work. Pressure cooker uses pressurized steam to cook the food in a short period of time, and it is acts as a vessel where water or other cooking liquid or stock is boiled. The steam produced by the boiling liquid is trapped inside the tightly sealed vessel which will then rise the temperature and the pressure inside the cooker. The moment the pressure cooker reaches its maximum pressure, the heat is lowered and that is when the time of cooking begins. The pressure cooker can cook food in about 10 minutes. However, it may vary depending on the quantity and temperature of the food. Other factor that may alter the time of cooking includes the amount of the liquid used, the heat source and the size of the cooker. On the other hand, a slow cooker works by heating the pot from the bottom to top. As soon as the heat starts to rise up, the food inside the cooker is being heated until it is cook. As mentioned previously, your cooking style is one factor to consider when choosing between the pressure cooker and the slow cooker. The following should be able to help you decide which to choose. A pressure cooker can be used to cook just about anything from meat and vegetables to rice and beans. Everything can be made into a sumptuous meal using a pressure cooker. However, they are more popular in cooking beans, vegetable stews and pulses. On the other hand, if you are into cooking meat, a slow cooker will do better than the pressure cooker. Although a pressure cooker is very capable of tenderizing the meat ,the slow cooker on the other hand cannot only tenderize the meat but also capable of adding more flavor and juice to the meat. The reason for this is because it is able to immerse the ingredients over the span of time. Which Cooker is Safer to Use? Safety is very important in the kitchen. And it is very common that all appliances in the kitchen, may it be a small appliance or a large one, comes with and instruction manual. So before you use the cooker, you must read and understand the manual first. In the manual of the pressure cooker you will find the safety instruction with regard to attaching the lid to the pot. It is important to know this detail because it will affect the cooking process of the pressure cooker. Furthermore, knowing how to open a pressure cooker is equally important as closing one. It is important to release the steam from the pot completely before opening the lid. Injuries such as burn may be a result if the pressure cooker is opened prematurely. Since pressure cookers are stove top and requires heat, you cannot leave the cooker unattended. Meanwhile, the instruction manual of the slow cooker is easier to understand and also the slow cooker itself is easy to use compare to a pressure cooker. You can leave the slow cooker while away for hours without any worries. Not everyone in the kitchen loves to clean after their mess, which is why it is also important to know how to do the proper care and maintenance of these kitchen appliances. The pressure has several components such the lid, the pan, the gasket, and other accessories and it should be cleaned separately. More importantly, it is advisable to clean especially the gasket every after use. There are pressure cookers that are not safe to clean in a dishwasher therefore read the manual prior to cleaning. For tough stains on an aluminium pressure cooker, soaking is a must and then scrubs the pan and the lid using a mild cleaning detergent. 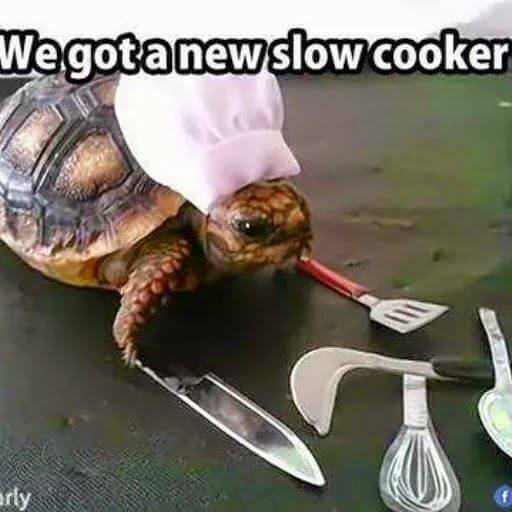 Meanwhile, a slow cooker is manufactured differently. Therefore it is important to read the manual that comes with the package. For instance, an aluminium cooker is washed differently to glass slow cookers. Be sure to unplug the slow cooker prior to cleaning. The difference between the two kitchen appliances is obvious. From the name itself, the pressure cooker uses steam pressure while a slow cooker uses low heat. Furthermore, the time to finish the cooking process is significantly different between the two. If you can wait for a period of time for the food to finish cooking then a slow cooker is perfect for you. On the other hand, if you want a fast cooking a pressure cooker is ideal for you. It is important to know what is ideal for you before you make an investment.